Initially Earth Hour started off as a lights-off event in Sydney, Australia, in 2007. It has grown to engage 188 countries and territories to raise awareness for energy consumption and effects on the environment. By turning off non-essential electricity, participants join a global movement to raise awareness and take action for a healthy planet. For more information, please visit Earth Hour’s 2018 report. On Friday, March 29th, from 2 – 3 p.m. TDSB schools and offices are asked to go as electricity-free as possible for ONE HOUR. Wherever possible, our schools and offices will turn off all interior lighting except necessary emergency lights, and minimize fan use. In 2011, we saw our highest reduction in energy usage (29.9%.) at schools and offices. In 2017, we came close to our best ever reduction in energy use at 28%. Can we improve upon that reduction this year? Earth Hour presents a great opportunity to raise awareness about environmental issues and run campaigns focused on energy conservation and climate change. Its sharp focus allows you to undertake as little or as much awareness and action building as your school is ready for. This year, Earth Hour is expanding to shine the light on biodiversity and nature loss through the #Connect2Earth campaign. The TDSB Earth Hour poster/checklist can serve as an organizing tool for classroom or school-wide endeavours. Educators can jump in to lead an Earth Hour Electricity Walk supported by the lesson plan and PowerPoint Presentation. For this year’s theme of biodiversity and climate change, start conversations with your students on why nature matters to them and help them understand how nature sustains us. To learn what people around the world are saying how they #Connect2Earth, visit the Global Earth Hour website. Click here to visit free teacher-suggested lessons ideas to compliment your energy-saving initiatives. This Earth Hour, millions around the world will be turning off the lights and speaking up why nature matters. 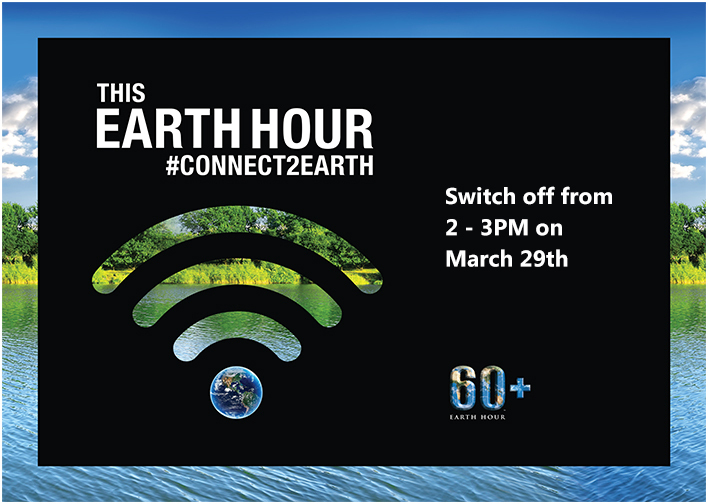 Join TDSB schools and offices as we celebrate Earth Hour by turning off unnecessary lights and unplugging electronic devices on Friday, March 29th, from 2 to 3 p.m. Additionally, families and community members can participate on Saturday, March 30th, from 8:30 to 9:30 p.m. Consider registering your actions or event at the Global Earth Hour website. Tweet this year’s #EarthHour 2019 actions using @EcoSchoolsTDSB Tell us if your school is already going beyond Earth Hour itself! Do students take an active role in organizing the campaign? Inspire and challenge other schools across the city. Write to jenn.vetter@tdsb.on.ca and tell us about any specific actions (e.g., a regular monthly or weekly Earth Hour) and what small changes are happening.